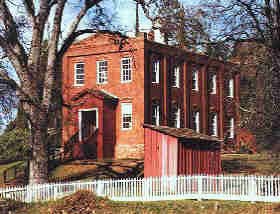 The Columbia School, California’s first two-story brick schoolhouse, stands alone on a gentle hill near the top of School Street. Built in 1860 of locally made, sun-dried bricks, at a cost of $5,000, the school opened in November of that year with 368 students, two teachers and a principal. The first floor held the elementary classroom, upstairs the older students concentrated on their studies. Sitting on the hill as it does, the kids must have been able to hear the school bell from all over town, leaving no excuse for being tardy. The size of this school shows how prosperous the area was from the number of children it was built to hold; all those families had to have a reason for living here and the reason was gold. Also located on the school grounds are two outhouse buildings, offering seats of differing sizes to accommodate all the students. The school was in continuous use until 1937 when it was closed for not meeting California earthquake requirements. The building was totally restored in 1960 at a cost of $60,000, and the neat thing about this was that $57,000 of the funds were raised by schoolchildren all across California who pitched in to help save the old school. On display inside each classroom are the old wooden desks with their inkwells, the slate blackboards, and other teaching tools such as flash cards, old books, maps, and the dunce cap. Two wood-burning stoves—which the boys kept supplied with wood—provided heating for the kids, who either roasted or froze during the winter, depending on where they sat.